The gender pay gap, gender disparities within the ranks and employee defections are some of the most pressing challenges that need to be addressed by the finance industry today. But how do we tackle these urgent issues and unlock the full potential of women in the industry? 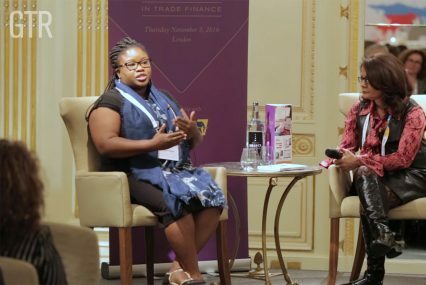 That was the key question on the agenda when GTR gathered industry figures – women and men – to its third Women in Trade Finance event in London on November 3. “The finance industry, I believe, has the biggest challenges and the biggest opportunities when it comes to gender equality,” said the evening’s first speaker Rita Trehan, a former Fortune 200 chief human resources officer and top global consultant. One of the issues discussed by Trehan was the gender pay gap in the finance sector. Among other statistics, she pointed to new research showing that the UK finance industry has a 20% greater gender pay gap than other industries. The evening’s second speaker was Bo Masole, founder and CEO of Victus Global, a food technology consultancy, and the co-founder of Mukaya Impact Partners, which supports women-led and women-focused SMEs in Africa. She shared her personal story of leaving the corporate world after 10 years to set up her own business, and gave the audience the opportunity to share their stories too. “I had reached senior positions but I felt that no matter how hard I was working, how much I was delivering, I was never quite appreciated as much as my male colleagues were. I knew that I could do better than this,” Masole said. In the video, the two speakers discuss the gender pay gap and the significance of 2069, and give their answers to what it takes to change the statistics.